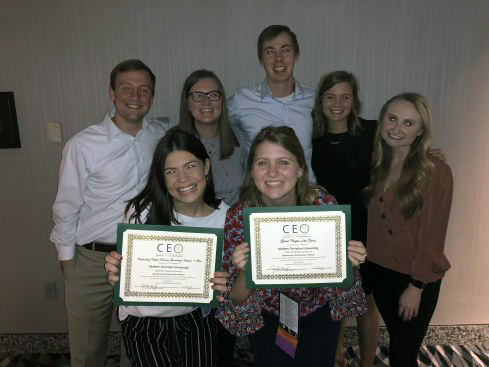 Abilene Christian University’s chapter of Collegiate Entrepreneurs’ Organization was named 2018 Global Chapter of the Year for the fourth year in a row at the CEO Global Conference and Pitch Competition in Kansas City, Missouri. The Global Chapter of the Year award is given to a CEO chapter that demonstrates excellence in organizational development and the ways in which the chapter offers a meaningful entrepreneurship experience for students. ACU took home the honor and a $250 cash award, outperforming larger universities such as Texas A&M University, Florida State University and Iowa State University. ACU’s CEO president Meredith Orr, a senior business marketing and management student from North Richland Hills, Texas, said she is proud of the work the members have done to provide the best content and opportunities for students. “I was especially excited about the win because I have been in the organization every year we have won, but this was my chance as president to prove that we are continually getting better,” Orr said. ACU’s CEO chapter has had a hand in developing numerous programs and opportunities to spread awareness and instill practical skills of entrepreneurship in students, among them Wildcat Ventures, Entrepreneur Speaker Series, Springboard Ideas Challenge and Startup Week.